Many parents like to travel with their kids and modern conveniences, such as portable travel cribs, make it so easy. These cribs provide a familiar environment for babies when they are away from home and give them a safe place to sleep and play in a non-baby-proofed area. So, it’s no surprise that parents consider these a must-have baby product. If you want to travel with your little one, take a look at my list of the best portable cribs. With these cribs, you can travel comfortably with your kids no matter where you plan to go. Traveling light with kids seems like a contradiction because there are so many things to bring along. But the Graco Travel Lite crib doesn’t add too much to the luggage due to its less-than-20-pound weight. It can be stowed in a standard car’s trunk and carried in your hand. It’s 20% smaller in size when compared with standard Graco cribs, so it’s easy to store and you can even put it under the bed. Once assembled, it can be placed in a corner, whether in the living room or bedroom. There will be less space needed for it than a regular crib, so there’s still room to move around it. But even with its compact size, your infant will have sufficient room to move inside the crib. There’s even room to roll around during their playtime. What's Great About It: This crib grows with your baby from being a newborn to a toddler, since the crib has a 2-level height-adjustable bassinet. It’s easy to fold and unfold with the single press of a button. It folds up in a compact manner, so it can be taken anywhere with you, from the park to a grandparent’s home. For an even lighter travel crib, the BabyBjorn Travel Crib is a great choice. With its 13-pound weight, anyone in the family can carry it along. Despite its light weight, it’s made with durability in mind, and it can accommodate children from newborn to 3 year olds without falling apart. Be sure to use it within the recommended age and weight limit, because these aren’t as strong and sturdy as standard cribs. It can be opened and closed with a simple one-step movement. The crib’s legs automatically unfold as soon as it’s set down on the floor, so there’s no need to struggle with it. The addition of a mattress transforms it into a practical travel crib. The mattress is both comfortable and supportive and perfect as your baby’s temporary bed. It has a built-in base plate that serves as a weight to keep it from folding over when your baby’s in it. What's Great About It: The open mesh material used for the side panels serves two purposes. First, it ensures maximum air circulation in the crib. Second, it provides adults with see-through panels to check on their baby. When it becomes dirt, the crib fabric and mattress cover can be washed in the washing machine. It can also be spot-cleaned with a damp cloth and soap-and-water mixture. It can also be deodorized with baking soda spread on the organic mattress to remove the unpleasant smells associated with having a baby. This Graco Playard should only be used by children under 35 inches in height and without the ability to climb out of it on their own. Babies who can already push up on their hands and knees shouldn’t be allowed to use it either. The travel playard has a 15-pound weight limit and it perfect for your little one. The bassinet should only be used by an infant. The bassinet is removable and foldable so that a crib mattress for an older baby can be placed inside. The crib provides sufficient space for an older baby’s playtime needs, so it becomes both a place for sleeping and playing. The smaller dimensions work in its favor – it is 20% smaller than a standard crib. There’s one less space-hogging piece of furniture to worry about. This crib can easily be placed in the corner of a hotel or living room. When folded, it’s so compact that it can be stored in a trunk with room to spare. The wheels make it easy to transfer from one room to the next. What's Great About It: The playard comes with a convenient carrying bag so it’s easy to carry around. The crib also has soft toys on the toy bar that will keep your child entertained. More toys can be added to the bar if you would like. The Lotus travel crib meets most of the criteria for the best portable travel cribs. 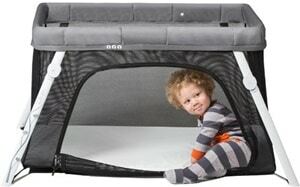 This is a lightweight crib at just 13 pounds, but it is strong and sturdy enough to accommodate a toddler. The soft and supportive mattress measures 42″ x 24″ so it’s almost the same in size as a standard crib mattress. It is made from a non-toxic, high-density material that will not sag after a few years of use. The mattress should be cleaned, aired and rotated regularly to maintain its integrity. Set up takes just 15 seconds, so your baby can settle in as soon as it’s opened. Assembly and tools aren’t required, a convenient feature for busy parents. 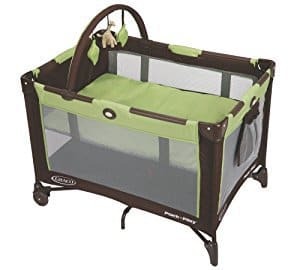 What's Great About It: The crib has the Greenguard Gold certification, so it’s among the safest cribs available. Both the crib and the mattress were manufactured without the use of harmful chemicals like lead, low-VOC, PVC, flame retardants, and phthalates. The lightest of the travel cribs on my list, at just 7 pounds, the phil&teds crib can be carried in your hand virtually anywhere. The compact dimensions make it easy to use even in recreational vehicles. 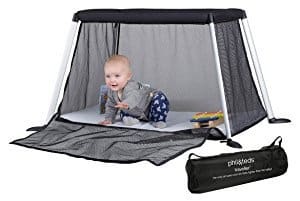 When fully opened, it measures a relatively spacious 54” x 33” x 26” for your baby to enjoy during their waking hours while also providing a feeling of being in a safe cocoon while they sleep. When closed, it can be placed inside its carry bag for storage purposes. Just as with the other travel cribs here, the phil&teds model is also easy to open, even with just one hand. There’s no struggling with loose parts, push buttons, and tools for assembly. It can be set up in small corners or in the middle of a room. Set up takes 30 seconds or less, so your baby can be placed inside it within a minute after arriving at the destination. 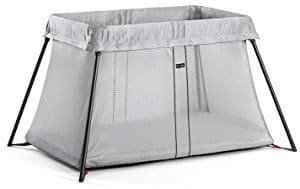 What's Great About It: If you’re looking for a lightweight yet durable crib and playpen in a single package, then you may want to put phil&teds travel crib on your shortlist. The full mesh sides create a see-through window for parents to see what their baby is doing. These see-through sides also keep your little one cool during their playtime and nap time. 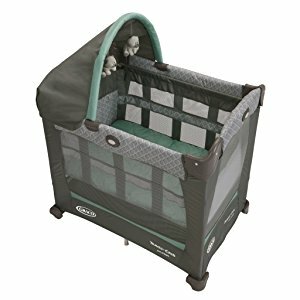 Travel cribs are great for traveling due to their light weight, ease of setting up, and convenience of carrying around. But these aren’t designed for everyday use, especially for prolonged periods of time. Parents are well-advised to keep such limitations in mind so as to ensure that their babies are safe while in these portable cribs. It’s always best to follow the weight and height restrictions recommended by the manufacturer. Otherwise, the fabrics can rip and frames can buckle when these limits are exceeded. Before using a travel crib on a road trip or in new surroundings, your baby must first be acclimatized to its use. Let them nap and play in it for an hour or so at a time so that they can become accustomed to it. Check that the crib and its mattress are set on an even, smooth and stable ground. Choose a site where it can be as stable as possible, especially with an older baby who moves around more. The floor or ground should also be smooth to protect your baby’s fragile back when sleeping. Follow the weight and age recommendations. With portable cribs not made with an all-wood construction, these are less durable than standard cribs. When the portable crib starts to show wear and tear, it’s always best to replace it. The risk of injury increases due to the fraying fabrics or loose parts. Place the crib in a safe place. The best site is beside your bed, but away from the windows, furnace or radiator, and air-conditioning unit. The crib shouldn’t be placed beside a window since exposure to direct sunlight for prolonged periods can be harmful to babies. The exposure to cold and heat sources, especially near fridges and stoves, is obviously dangerous too. Ensure that there are no objects that can cause strangulation, suffocation, and choking in the crib. Keep it simple so that there are no pillows, stuffed toys, and other toys inside the crib. Even extra blankets in a portable crib can cause strangulation or suffocation in babies. The best course of action is to dress your baby in appropriate clothes depending on the ambient temperature. The blankets can then be removed from the picture. Place your baby in the crib so that they sleep on their back. Their feet should be at the foot of the crib, too. Babies who sleep on their back are less likely to succumb to SIDS. Ease of use, especially in assembling and collapsing the crib. Ease of transportation, so wheels and carry bags are great features. Check the weight and its folded dimensions. The lighter and smaller it is when folded, the better for portability. Balance it with the strength, sturdiness and stability of the frame and fabrics. The more durable it is, the safer your baby will be while in the crib. Ease of cleaning, with machine-washable covers being best. Travel cribs are among some of the most necessary baby products that parents should invest in. But be sure to use it properly, as these are simply tools to ensure your baby’s comfort, safety and wellness.